Julian Schaffner, John Cusack, Carmen Argenziano et al. 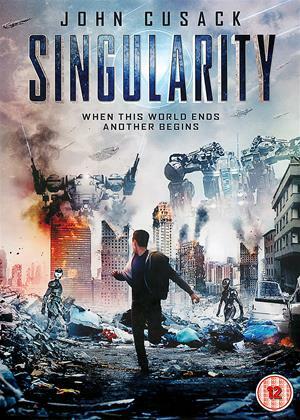 In 2020, Elias van Dprna (John Cusack), CEO of the world's' largest robotics company, introduces his most powerful invention: Kronos, a super-computer designed to end all wars. However, it quickly determines that mankind itself is the biggest threat to world peace and launches an attack to rid the earth of the "infection" of man. Years later, a small team of survivors set out in search of a new world where mankind exists without fear of robot persecution. But does this world actually exist? And will they live long enough to find out? Yes I was sucked in by the cover. In fact the film plods along at snails' pace trying desperately to emulate Hunger Games, Teminator 3, Oblivion and other far superior movies. John Cusak plays his role marginally better than a truckle of cheddar cheese (he must really have needed the money), and the lead protagonist played stoically by Jeanine Wacker ain't no Jennifer Lawrence though that was clearly who she was meant to resemble. Shot mainly in a forest with open glades (sound familiar), the CGI is impressive for the brief moment in time that it appears but it's mainly drab cityscapes, woodland and banks of computer screens supposed to suggest the lair of the evil conspirators. The final words from Cusak " Let it begin " alarmingly suggests a follow up. NOOOOO. Please. In short i'd have preferred to watch paint dry. A grim-faced John Cusack spends the entire film staring at screens after his AI invention Kronos has annihilated most of the human race. Meanwhile a teenage couple wander around a Czech forest looking for a fabled Utopia called Aurora. These scenes were shot in 2013. Cusack’s scenes were shot years later, which is why he never leaves his dark screen room and doesn’t interact with anyone. There are a bunch of special effects to begin with as mankind is annihilated, but the bulk of the film is Young Adult melodrama. It all adds up to no more than a studenty low-low-budget bore. If you’ve been fooled and enticed by the effects-heavy trailer, you might want to ask for your money back. what was the writers plan here, possibly watch the most well known AI taking over the world type films and rip off the best bits and reproduce them badly? Well if that was the plan it was a success! Here's a notion to ponder, Carmen has a smart phone that is used for GPS to find Aurora, why didn't she just google map it? Or dial 118 and ask for their number and call them up for directions. How come the bad guys didn't just use her GPS signal to follow her instead of building a "human robot" who didn't know he was a robot (where have I seen that before, oh yes Terminator Salvation) at obviously considerable effort. But the best and most puzzling part.................................. After 90 years where the hell did she plug the damn thing in to charge it??????? apart from that, after 90 years how come the lawns outside the building get to be trimmed, and why were the several paths that they ran down not over grown? Life's full of mysteries , one of them is why did I waste my time watching this poorly produced tripe till the end? I would have added a spoiler alert, but there was no point, the director has already spoilt it enough! Just awful. Agree with other reviewers that John Cusak must really have needed the money. Terrible, cut-and-paste plot, wooden acting, and a script you could use to cure insomnia. Some feat to rip off so many successful films (Terminator, Hunger Games etc) and manage to reproduce absolutely nothing of what made them so watchable. I, too, switched off after 25 minutes - life’s too short!